These aren't the most fully-featured fitness headphones on the market, but they don't need to be. Bose stuck to what it knows best, and just ties in with popular fitness apps you're probably already using. What's more, you get that quality, signature Bose sound when you're on your runs. In the current age of wearable technology it can be tempting for manufacturers to shove as many sensors and features into their products as possible. Watches are mini computers, bracelets can tell us if we've had enough sleep and earphones are slowly becoming full-on digital fitness coaches. The Bose SoundSport Pulse come equipped with a heart-rate monitor, to act as a fitness tracker directly in your ears, while managing to stay true to Bose's promise of quality audio. Are these sporty in-ears any good? As in-ear headphones go, the Bose SoundSport Pulse are pretty chunky because the large plastic casing contains the battery, Bluetooth radios and audio drivers. When placed into the ear, the big tooth-shaped exterior is hard to ignore, and almost feels unbalanced. Thankfully, they never fell out of our ears, and even if they did then the build and design is sturdy enough that we wouldn't be worried about them breaking. This large black plastic exterior casing is covered in a grippy black plastic and attaches to the glossy polycarbonate earphone. On the right ear, this exterior housing plays home to the power/pairing button as well as the micro USB port, which is covered by a water-sealing flap. On the left earbud, there's nothing built on or into the black plastic housing, but there is a heart-rate sensor built into the underside of the earbud to read your pulse. Like the Lightning connector-equipped JBL earphones we reviewed earlier in the year, the Bose SoundSport Pulse has squashed cone-shaped eartips. Think those cones you had to dribble a football around during PE lessons, make them tiny and use a grey soft silicone, and you're there. While it's not an usual design for an in-ear headphone, this cone shape has its benefits. First of all, it's more comfortable to have shoved in your ear canal than round ball-shaped tip. What's more, because it gets wider towards the base, it does a better job of sealing off outside noise, and does it without feeling like you're pushing all of the air out of your ears and creating an uncomfortable vacuum like so many other earbuds. As is usually the case with in-ears, the SoundSport Pulse ships with three different sized ear tips. Curiously however, they're built into the same piece of silicone as the fins that help the earphones stay in your ears. We can't help but feel it would be better if they were separate, to make it a more customised fit. It does have one major upside this way though: it's easy to remove and re-attach. You don't have to mess with two fiddly, hard-to-apply bits of silicone. There's a three-button inline remote built into the cable which attaches the two earbuds to each other, complete with a small clothing clip. This remote is placed about two inches below the right earbud, so is very easy to reach while jogging along, and the indented multi function button is easy to find without having to look with your eyes. This remote features a microphone for hands-free calling, volume up/down buttons and a main central button used for playing, pausing and skipping tracks. It also happens to have a built-in NFC chip for automatic pairing with compatible Android phones. Bose clearly knows what it's good at: making quality sound. It's not a fitness tracker company, so the built-in heart-rate monitor is designed to work with third-party apps. You can connect the earphones in-app and then have real-time heart-rate data tracked by Strava, Endomondo, MapMyRun, Runkeeper or Under Armour's Record. All the major bases covered there. Bose does have an app for SoundSport, called Connect, but it's kept things simple. Once downloaded, it automatically detects the earphones are nearby (if they're switched on), then simply drag down on the image of your earphones to connect them. Disappointingly there's no equaliser built into the Bose Connect app. Depending on which app you use for music streaming, however, you can adjust the balance with one of those. Spotify, for instance, has a load of preset audio settings. You can pair the SoundSport with multiple devices. We used them connected to a PC, OnePlus 3T, iPhone 7 Plus and the fourth-generation Apple TV. In each instance it remained connected and clear. More importantly, however, is that the SoundSport stay connected when out running. During our testing there was never a single instance of the audio dropping out, not even for a split second, which sometimes happens with Bluetooth earphones. And this was with the phone wrapped around the waist in a snug-fitting belt/pouch. Bose promises five hours of playback on a fully charged battery, but in our testing it came up a little short. They needed charging after approximately four hours of use. Bose has made something of a name for itself when it comes to sound quality. 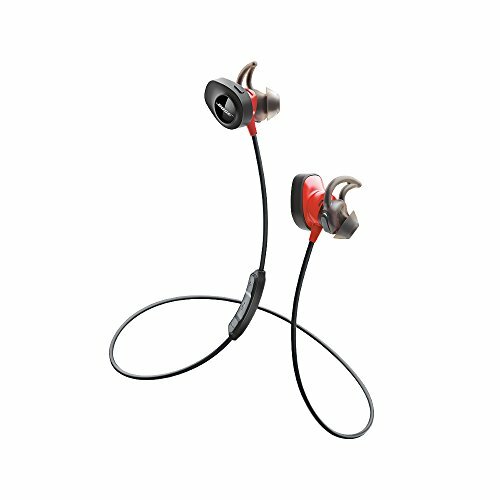 Despite being a pair of sports earphones the SoundSport Pulse continue that reputation with great balance of frequencies. The audiophile might take a listen and think there's too much bass, but it serves to provide a fullness and immersive feel to songs when out exercising. Mids and trebles are suitably levelled to produce tracks that are easy to enjoy, regardless of the genre of music. If there's any criticism, it's that sometimes the higher-end lacks a little clarity. It's certainly not something you'll care about while you're getting your sweat during a 10k run, or bench-pressing the equivalent of a small bus at the gym. You'll just be enjoying the fact that there are wireless sports headphones with no real compromises on sound. When choosing earphones to use while exercising there are three key features: they need to stay in your ears, they need to stay connected to the phone, and they need to sound good. The Bose Soundsport Pulse deliver in each of these key areas, plus they're comfortable to wear. Sure, they aren't the most fully-featured fitness headphones on the market, but they don't need to be. Bose has stuck to what it knows best, and by associating the built-in heart-rate monitor with popular third-party fitness apps rather than trying to create one of its own. But above all else it's that signature Bose sound quality that makes the SoundSport Pulse a winner. If you don't mind forking out an extra £50, you can grab the truly wireless Jabra Sport Elite earphones which - like the Bose set - have a built-in heart-rate monitor. However, these add to that with gyroscopes and sensors for measuring distance and cadence while you run. With the included battery pack case, you can get nearly nine hours of playback before needing to plug them in too. They may not be wireless, and be iPhone exclusive (thanks to the Lightning connector), but the JBL Reflect Aware are very comfortable to wear, much lighter than the Bose and have secure fit in the ear.